“Digital killed the magazine industry”, really!? The answer is no. Cygnus Business Media CEO Jhon French has noted an interesting behavior. People in the age group of 20 to 30 years are showing interest in reading magazines than ever before. Especially the independent and niche related magazines are loved by the people in the age group mentioned above. If you are making a magazine design, especially for the mass audience in the age group mentioned above; these trendy looking magazine mockups will come in handy for you. The sudden surge in the magazine readers rate is related to several factors. One of the most important factors is that people are aware that false and fake news are spreading fast in social and other digital media. For example, several problems faced by Facebook in the past few months show the trustworthiness of the contents we see and share. Readers are now ready to pay for original and trustworthy contents. Niche-specific magazine with authentic details and articles written by field experts is gaining momentum among readers. When authentic details are combined with visually striking designs you can grow your reader count. 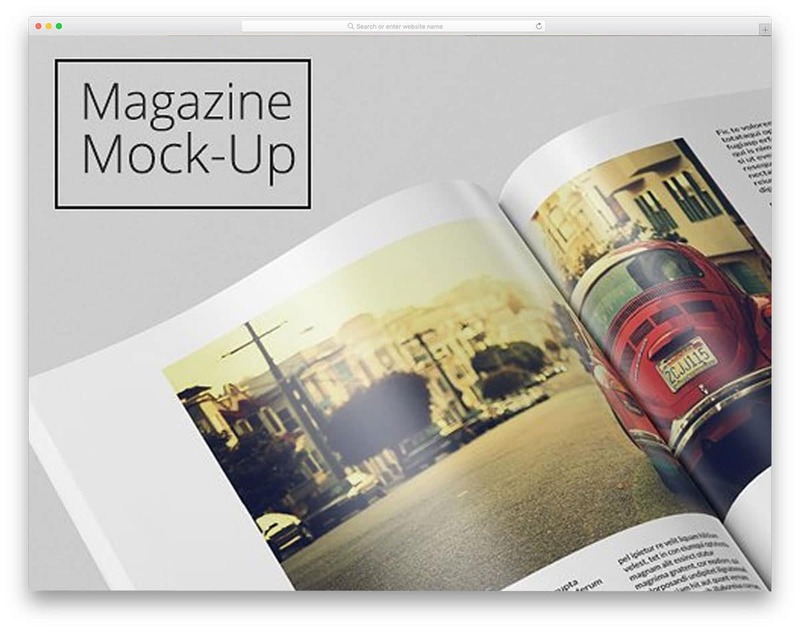 These magazine mockups will help you showcase beautiful and lively design of yours. Companies like Airbnb has tons of useful data that can help users and also help their business grow. With all these data Airbnb recently jumped into the Magazine industry and they are doing great. All the useful data insights are combined with smart reader-friendly design; which makes them grow faster then they think. If you are creating such reader-friendly designs that elegantly shows complicated data, these mockups will give life to your smart designs. US Letter Magazine Mockup as the name implies this mockup has the size of the US letter. 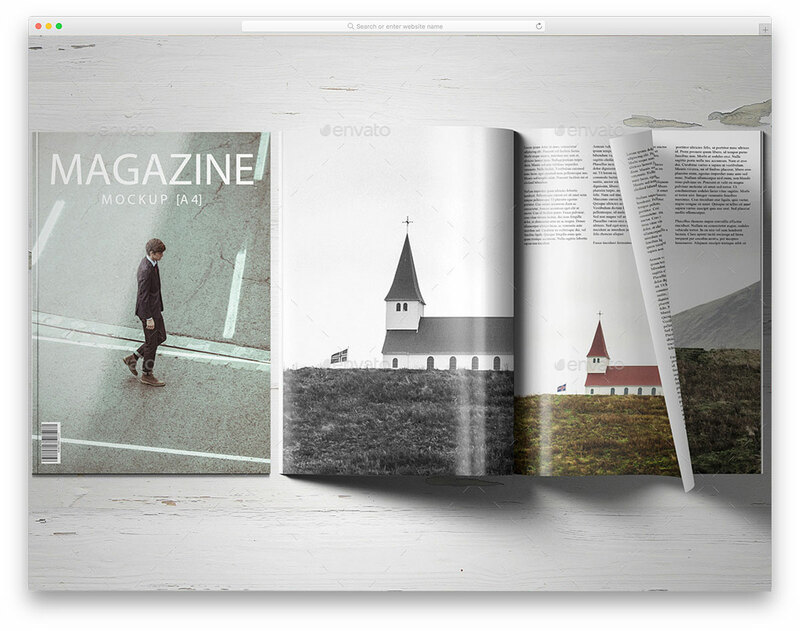 With the clean background, this mockup elegantly highlights the design of your magazine. You can show both the front and back of your magazine design. Apart from the cover image, you also have an open and folded image of the magazine to show the inner pages. This mockup can be used for design presentation for marketing ad banners. Shadows of the magazine are preserved so well and the best part is you can customize it easily. 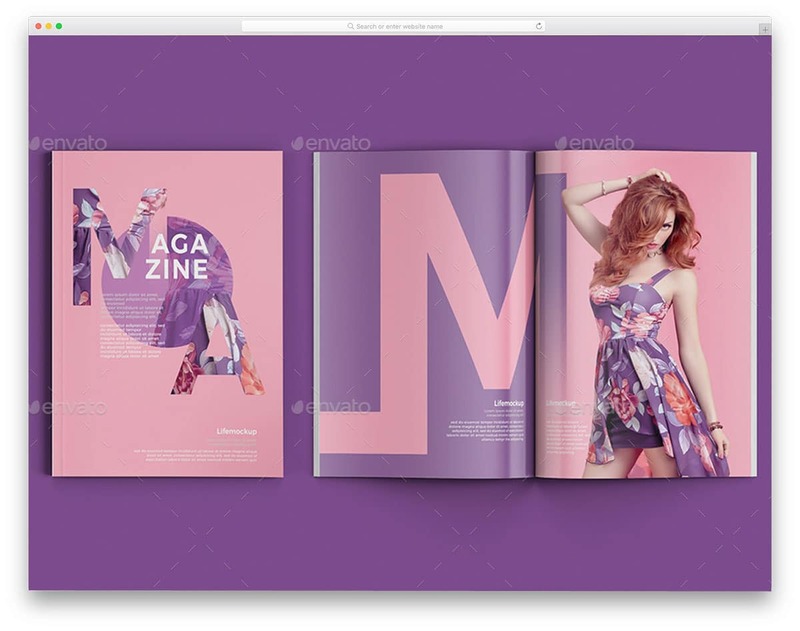 With this fully customizable magazine mockup, you get nine PSD files and size background images. The layers are handled properly so that your designs will blend in well with the magazine’s curves and corners. Typography plays a major role in magazine designs just like in the poster designing. If your entire magazine design revolves around the typography trend, this is the mockup for you. Though the default magazine mockup is designed for typography design, it can handle other types of design as well. With this mockup, you get front page, open book, and full center page mockup. You can showcase your design exquisitely using this mockup. The top view and the perspective view of the mockup help the user to clearly grasp your design. By default, you get a minimal background, which adds richness to your mockup design. But still, you can change the background as per your design needs. High-resolution images used in the mockup let you scale the images easily as per your requirements. If you are looking for some realistic magazine mockup, this is the one for you. The designer of this mockup has included ultra-realistic images. Each and every characteristic of the magazine material is preserved so well in this image. As a result, you get photorealistic images from this mockup. The reflections on the papers, curves on the folds, every detail is handled with care. All you have to do is to add your design to the mockup. Using mockups like this will help the clients or users to clearly visualize your design in the day to day life. Along with the magazine mockup, you also get other elements like glasses, candles, and bags. The best part is you can hide these elements if you want. US Magazine Mockup, as the name implies this mockup has US paper format. The creator has given you both open and closed magazine views in this mockup. So you can also show your inner page designs with this mockup. 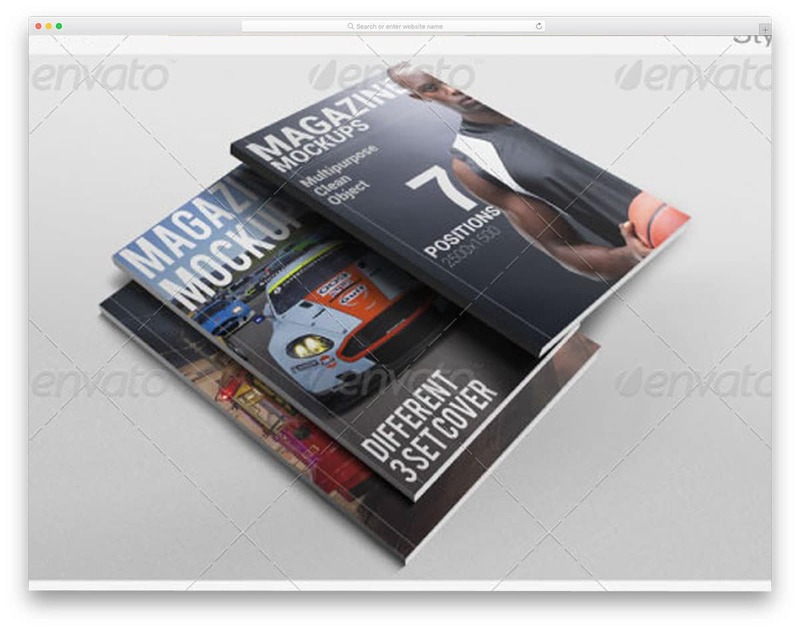 As a package, you get five PSD magazine mockups and all of them has properly arranged layers. You can also change the background of the magazine. Properly organized layers will help you easily find and edit the elements in no time. All you have to do is to copy and paste the design in the desired layer and present it to your audience or client. Today’s magazine businesses don’t see digital media as a threat. On contrary, they use digital media to grow their business. Some of the magazine publications even provide the same content in the digital form as well. Giving options like this will give subscribers the freedom to read the content in the form they need. 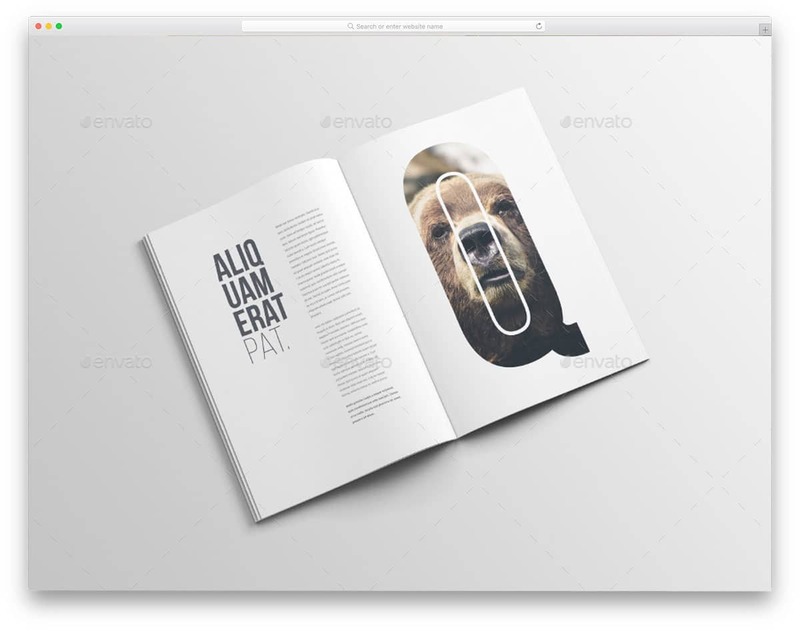 In this mockup, you not only have the magazine mockups but also iPad and iPhone mockups. Other extra features you get with this mockup is the editable background and the clips. With this mockup, you can create a scene if you want. Regular A4 sized magazine mockups are used in this package. The only small bummer with this mockup is it only gives 50% zoom in option. Other than that this mockup is perfect for showcasing your design. 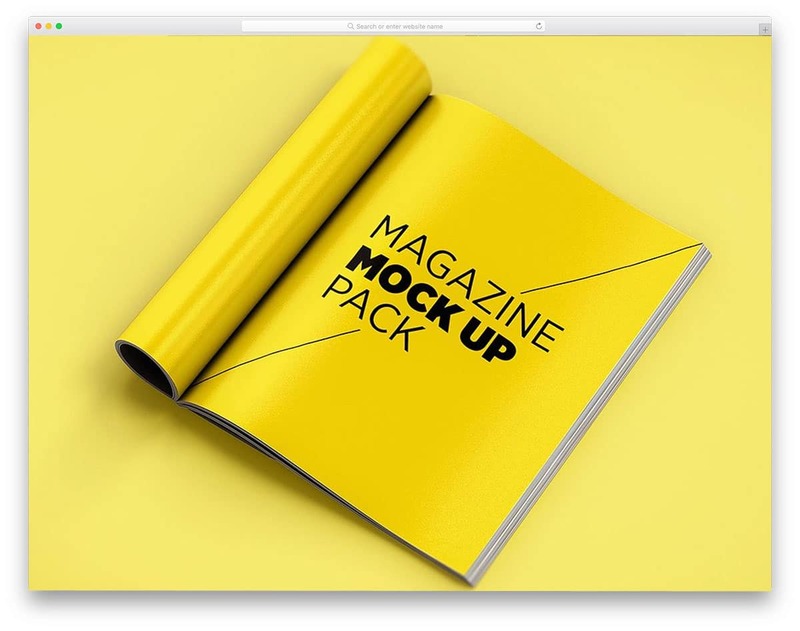 Magazine mockup V2 is a bundle of mockups. Though it is a bit pricey, you get many mockups in this single package. If you are an agency or professional designer, this mockup will save your presentation time. With this mockup set, you can neatly compare your designs. For example, if you have two variations, you can place them side by side and present it to the client. 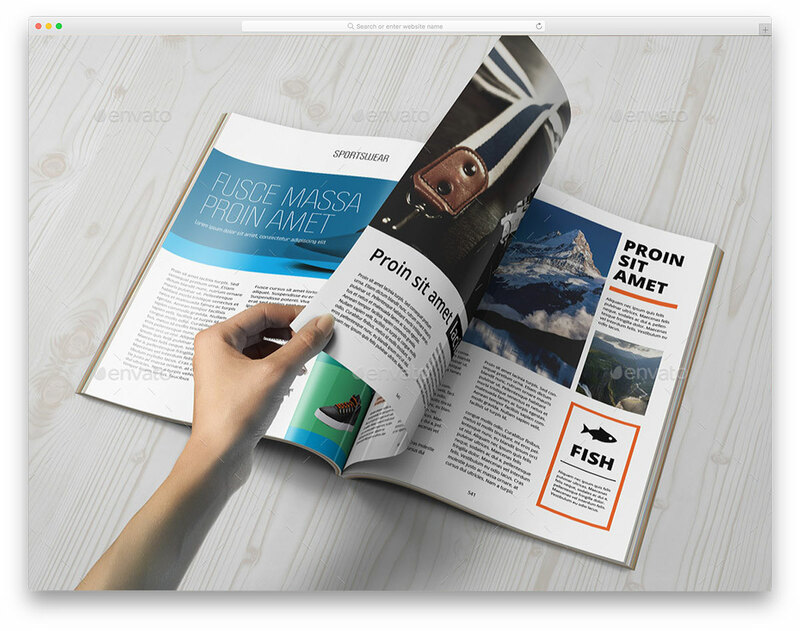 To give a realistic look the mockup has magazines with folded pages. The layers are handled smartly so that your design will look surreal even in the folded pages. In the download file, you get 14 PSD files and all of them have properly organized structure. Reflections and shadows are treated as separate layers so you can adjust them easily as per your requirement. If you like to give a real book feel to your magazine design, this is the mockup for you. The creator of this mockup has used real books and pages. With the help of modern tools and smart layers, the creator is able to give you realistic mockup. You can directly add your designs to the mockup and it automatically fits your design fit in well with the curves and bends of the pages. What makes this mockup unique is the use of realistic papers; it gives a natural look to your magazine design. This mockup includes the product shown in seven different angles and in seven different positions. Multiple magazines are also included so that the users can easily compare your designs. Ochre is a multipurpose mockup for print and media designs. This mockup can be used for magazines and books as well. With the warm color and minimal look, this mockup will add richness to your design. The designer of this mockup has given you three background images in this package. But still, you can add your own custom background image and color. By default, you get regular size magazines, but you can resize them easily if you want. Since the images in the mockup are designed like taken from inside of a house, you have shadows. The designer has given you the option to customize and edit the shadow effects. If you are making a design for interior design and construction magazines, then you can use this mockup as such. Images play a major role in the magazine. Using authentic high-quality images will help the readers understand the contents easily; it also help them enjoy the reading. In Photography magazines, images are also treated as a part of the design. This clean magazine mockup will help you present your design engagingly to the users. The mockup includes images of the magazine shown in different angles. Like all other magazine mockups, with this one also you can easily customize the background and textures. The shadows look so natural and are handled properly. No matter what background or color you use, the shadows of the magazine remain natural. Fourteen PSD files are included in this mockup set and all of them are easy to edit and customize. From the very beginning, the magazines related to lifestyle and women are very successful. The recently debuted “The Pioneer Women” magazine sold 150,000 copies in a week. If you are making visually striking designs for one such magazine, this mockup will help you impress your clients. The creator of this mockup has shown the magazine in various angles and perspectives. You can control almost every element on this mockup. For example, you adjust the lightings and the shadows based on your design. With this mockup, you can show front, back, and the center page of the magazine. You can use this high-resolution images even in your website design.17 PSD files included in this mockup will help you create an impressive presentation of your magazine design. 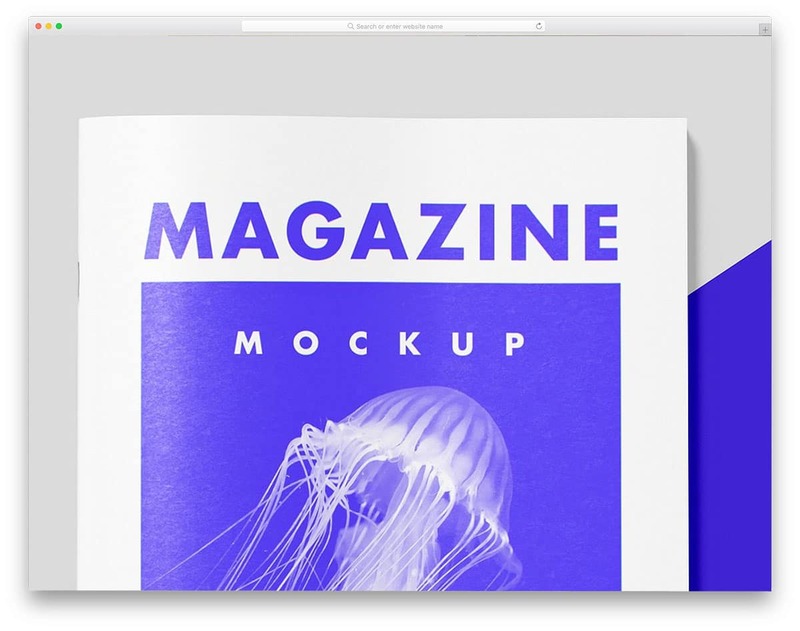 Magazine Mockups By Code ID is almost similar to the mockup designed by Ayashi mentioned above. With this mockup also you get a realistic magazine. The papers and the textures of the magazine pages are designed carefully so that you get a natural feel. No matter what design you add to this mockup; it will blend in well with the magazine pages. The curves and the edges are also designed with care to make your contents look real. Three types of designs are given in this mockup, based on your need you can pick the one you like. As usual, higher resolution images are used in this mockup so scaling the image won’t be an issue for you. As the name implies this mockup has A4 size magazine. 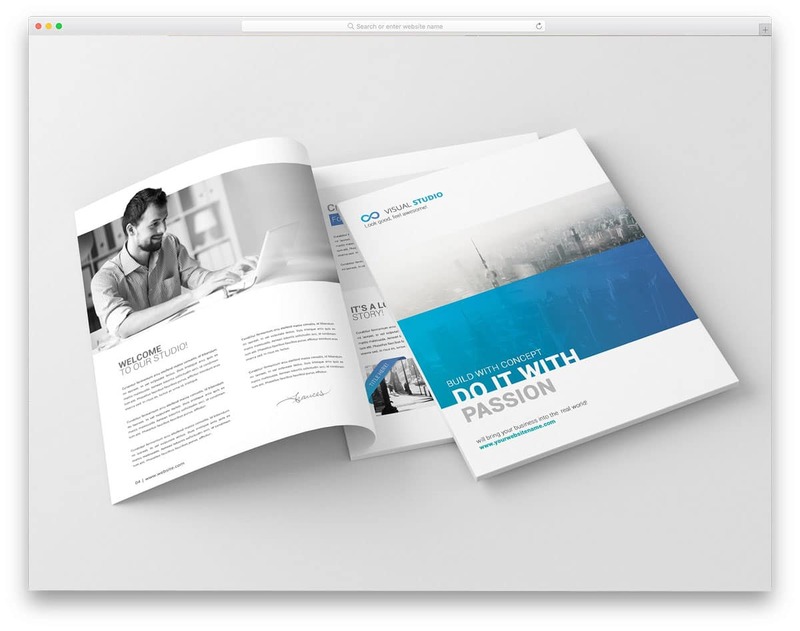 The designer of this mockup has designed it for both magazine and brochure purposes. 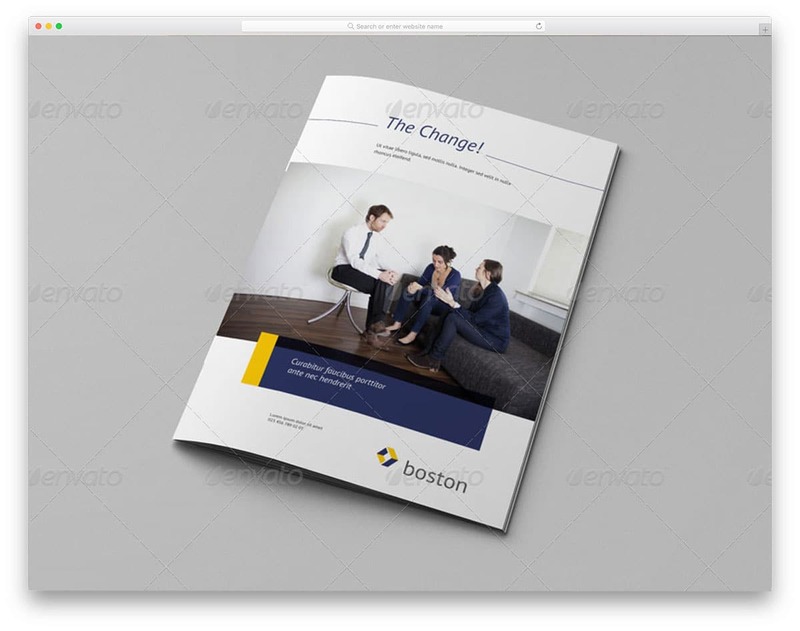 Clear layers of this mockup help you to show the cover design as well as inner page designs. 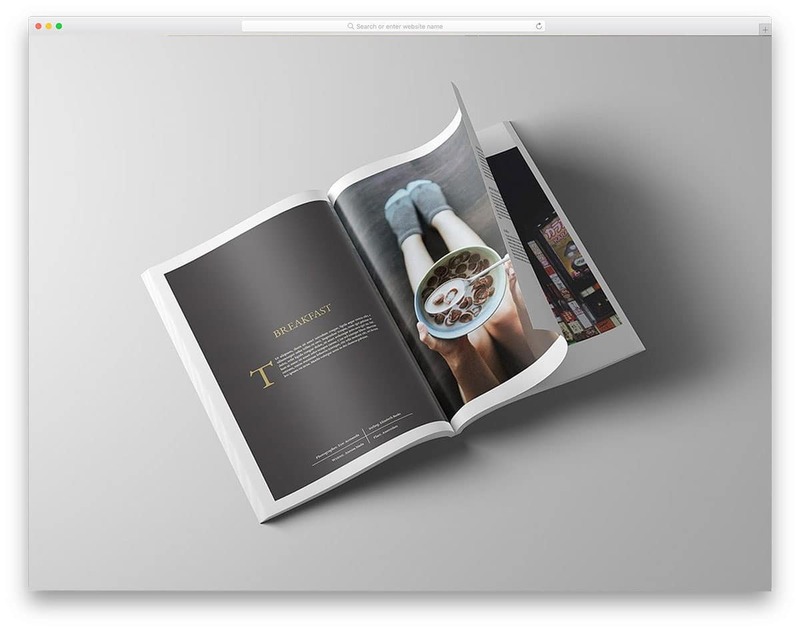 High-quality reflective pages are used in this magazine mockup. If you are planning to publish data-centric content with lots of charts, you can illustrate neatly in this mockup. By default, you get a neat minimal background. As usual, if you have special needs you can easily change the background image and colors. 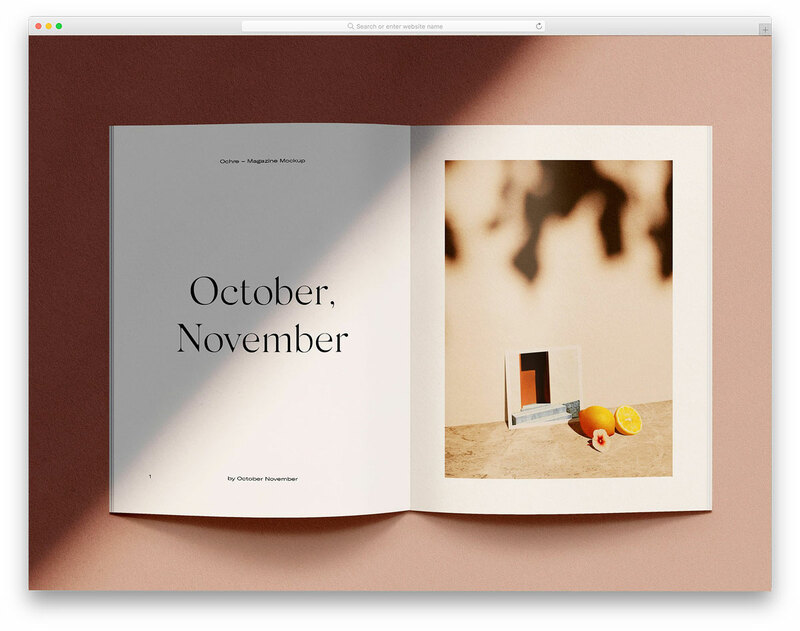 This magazine doesn’t have folded pages; if you are in search of one, check out the other magazine mockups mentioned in this list. This magazine mockup is also from the same creators of A4 magazine mockup mentioned above. You can expect the same pixel-perfect design with an easy to access file structure. If you are going to present more than one variations of your design, this mockup will come in handy for you. In this mockup, you have multiple magazines placed in one image so that the client or user can easily compare your other variations. In the download file, you get seven files and all of them are Photoshop files. All other customization options are almost similar to the A4 magazine mockup mentioned above. 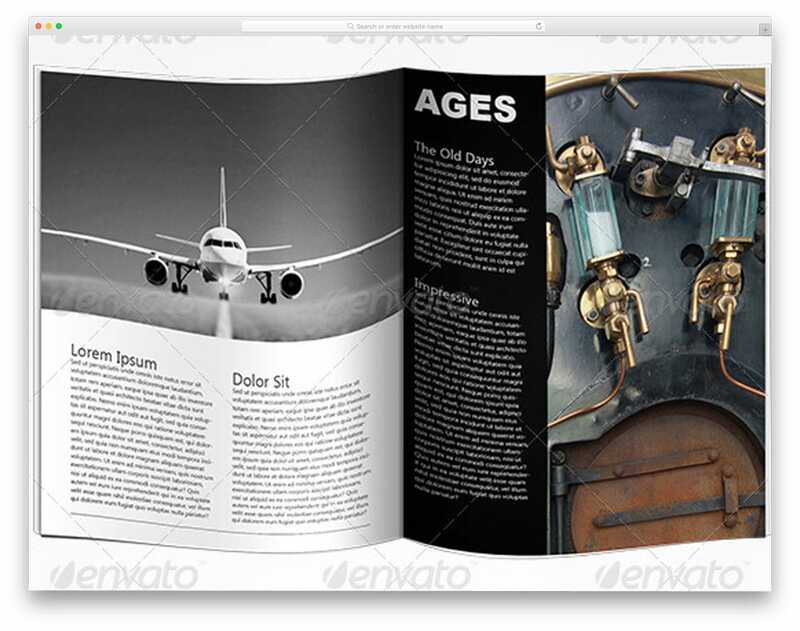 This magazine mockup has all the variations and folding types you normally expect in a magazine mockup. If you are a busy designer, this mockup will save a lot of your time. You can directly add your design files and present it elegantly to the users. All the layers are properly optimized so that you get a photorealistic image by using this mockup. In the folded page mockups, the contents neatly fit inside the mockup. With this mockup, you get eleven PSD files and six texture options. Customization-wise you get unlimited options, you can almost edit all the elements in this mockup. This mockup is a perfect presentation kit. 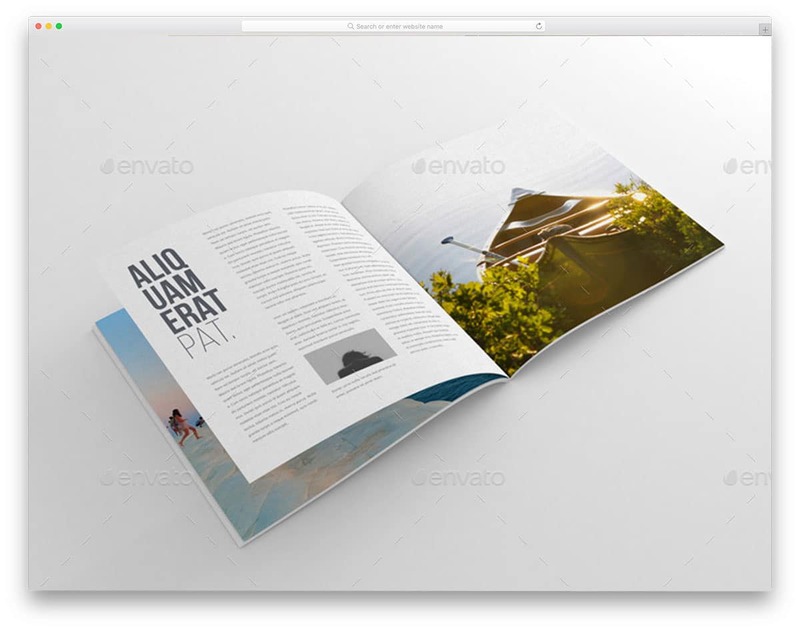 If you are designing the entire magazine, then this mockup is the best option for your presentation. As this mockup includes all the normal orientations, you can showcase your design clearly to the users. Reflections on the paper are also preserved treated properly so that your contents are not disturbed by the reflections. Just like in all other premium magazine mockups, this one also allows you to adjust the shadow. 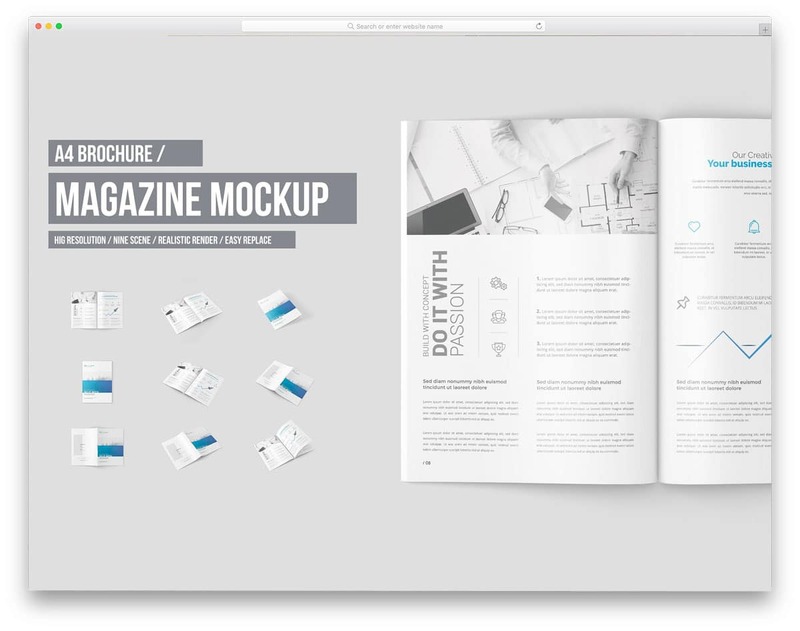 No matter what type of design you follow for your magazine, this mockup can handle it easily. You get A4 size magazine with this mockup. 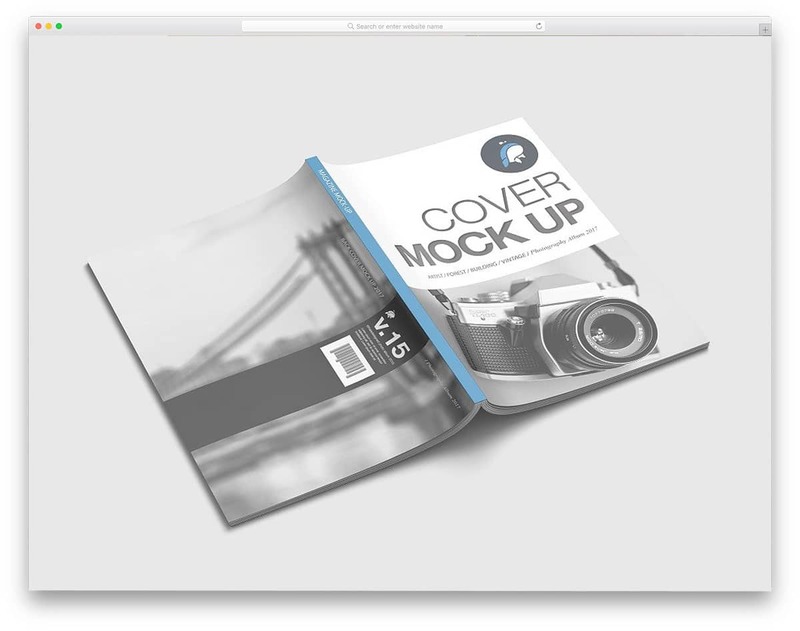 This mockup from the folks at Mockup Zone is a value for money pack mockup set. With this mockup, you get almost all major options and customization features. It will be your one-stop solution for all your presentation needs. Different texture and background options are also given in the mockup. All you have to do is to pick the model you want and start customizing it. The magazine images have all types of folded pages and open pages design. Shadows, reflections, and environment elements are given in separate layers. So that you can create a unique scene for your magazine design. A4 Magazine Mockup is a minimal looking clean magazine mockup. As the name implies this mockup has A4 sized magazines. 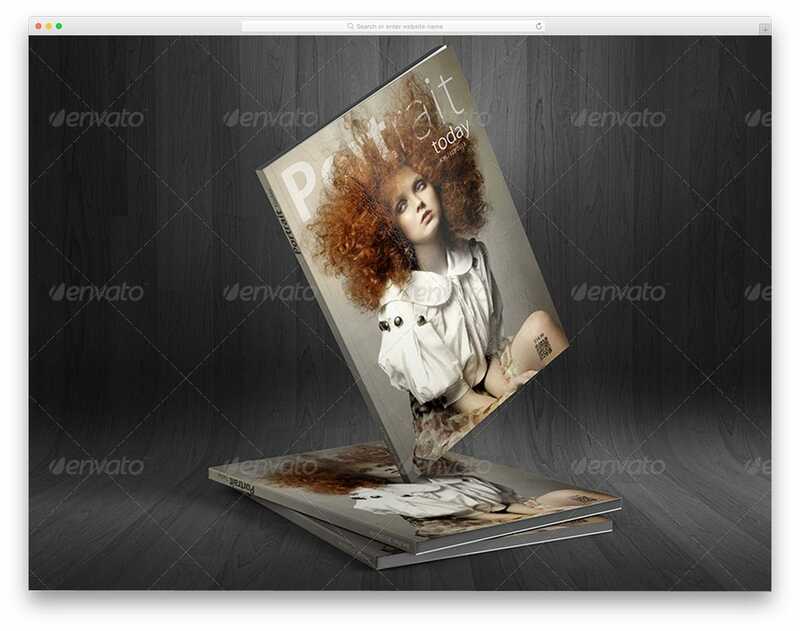 With the package, you get sixteen PSD files and each has magazines in different positions and angles. The creator of this mockup has included all types of positions from flat to z-fold that you would normally expect in a magazine mockup. Since it is a premium mockup you get builtin color options for shades and backgrounds. But still, you can add your own custom colors and backgrounds. Properly handled layers will make your customization job easier and also make your design fit in well within the mockup image. Square Magazine Mockup is another minimum looking mockup, but this one has a square size. The above mentioned A4 mockup is also from the same creator. Hence, you can expect the same quality in this mockup as well. All the customization options are pretty much the same as in the above mockup and you also get some customization related to this mockup. Since this mockup uses high-quality images of resolution 2500 X 1875, you get a highly detailed image. You can zoom up to 100% and still the image quality is maintained perfectly. Quantity-wise this mockup has fewer images than compared to the A4 mockup mentioned above In this mockup. you get eight square magazine image mockups. This A4 magazine mockup is a photorealistic one. The designer of this mockup has retained the characteristics and elements of the magazines neatly in this mockup. Layers are handled properly so that you get realistic natural images out of this mockup. No matter what type of design you add to this mockup, you get a perfectly balanced natural image. Another useful feature you get with this mockup is an iPad mockup. 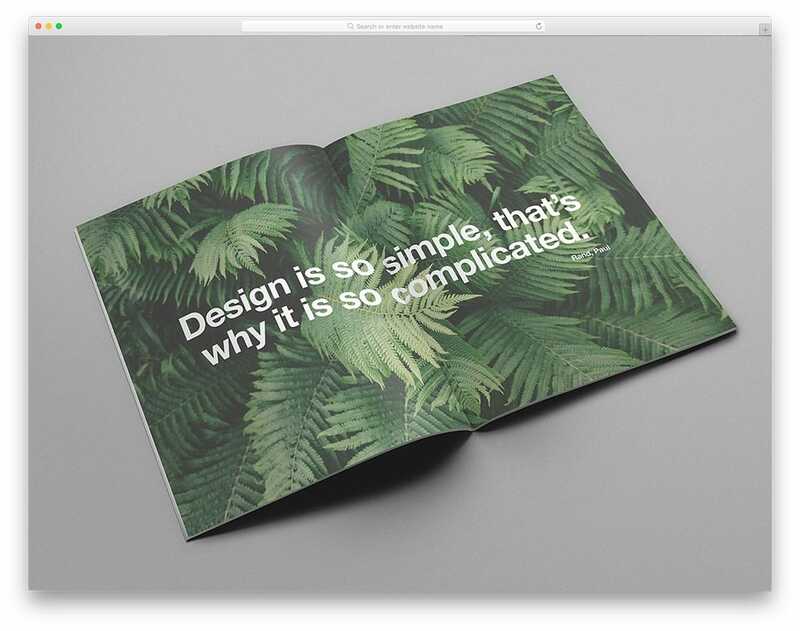 Since many publishers are embracing digital form of contents, showing your design in digital ideas can help you relate with your clients thought easily. With this mockup, you get 16 PSD files, which is more than enough to demonstrate all your designs elegantly. This magazine mockup is a very simple one. With this mockup, you get some basic images to showcase your design. For the cheaper price tag, the creator of this mockup gives you a realistic mockup image. The textures and the reflections of the magazine pages are preserved well in this mockup. This mockup is the best option to showcase your design in your portfolio and also to create website images. With this mockup, you can expect all the basic customization options. In the download file, you get five PSD files and all of them are organized properly for easier access. This mockup set is a multipurpose one. The designer of this mockup has made it flexible enough to fit the needs of all the three categories it is designed for. In the default demo, the creator of the mockup has kept it very professional. But, you can add any type of design to this mockup without any worries. Also to help you edit the file easily, the designer of the mockup has included four different styles and various background. If you are still not satisfied with the given backgrounds, you can always add your own custom background image or colors.